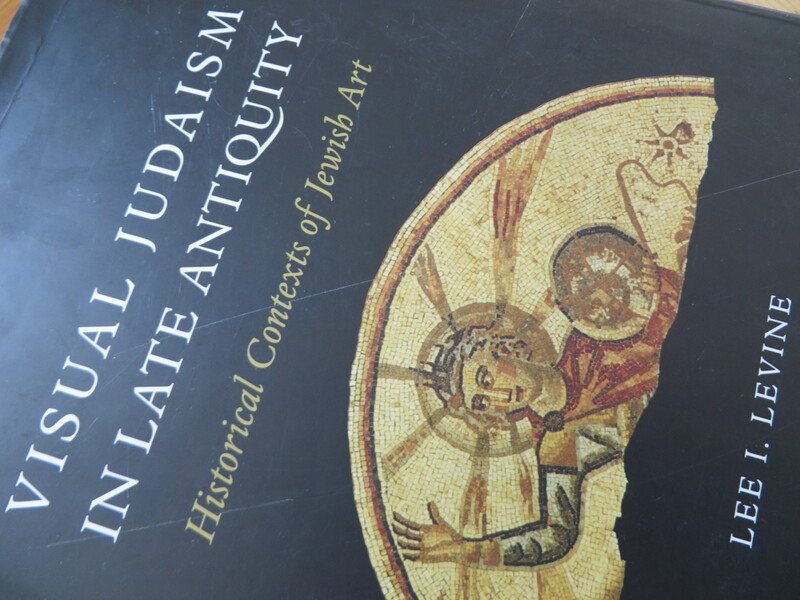 I just recently finished Lee Levine’s Visual Judaism in Late Antiquity. It’s a big book, and definitive. Its author’s historical judgments strike me as impeccable. These would concern 2nd Temple Period aniconism and the emergence of Jewish figurative art in the 3rd and 4th centuries, the roles played by urban elites and the patriarchate in this emergence, the political impotence of the rabbis at this point in Jewish history, and the influence on Judaism of Byzantine Christianity in late antique Palestine. Levine makes an important methodological point, namely not to read antique Jewish art in relation to the Jewish textual tradition or in relation to “traditional” Jewish themes such as salvation and messianism. There’s no reason to think the rabbis or their ideas had any control regarding the emergence of figurative art, one way or the other. About books about art written by students of Jewish history, I tend to have this caveat. While they shed light on the necessary historical contexts, as to art history and art theory, the results tend to be mixed. When social historians turn to the subject, they turn too quickly to “identity” as an explanatory model. It’s lazy Jewish Studies shorthand, having more to do with modern and contemporary Jewish Studies and its students, more to do with the vicissitudes of modern and contemporary Jewish identity than with the antique historical actors themselves, for whom identity may have been more taken for granted, less self-reflexive than it is today. In terms of academic Jewish Studies, what this means is that art is always marshaled in the service of a social or political identity, which means that the art is never looked at for its own sake and on its own terms, dialectically as a part of but also apart from its “historical contexts.” I’m willing to bet that emergence of Jewish art has as much if not more to do with pleasure than with identity per se. Marc Epstein’s work on medieval Jewish art is an exception. But he’s also a Religion Studies scholar, not a historian per se, which sort of makes my point that the very notion of aesthetic pleasure often goes missing in the study of Jewish history, as if pleasure and pain were not constitutive of the identity historians seek to track. Except for once (p.450), Levine tends to view art in isolation from other forms of aesthetic-sensual pleasure. Consider the rabbis in this regard. Levine assumes that “the rabbis” were aniconic, more likely to proscribe art than not. He concludes on this basis that the rabbis had no real political influence in late antique Jewish society. About the concluding point, I have only little doubt that Levine is right. It is probably also true of early tannaim, like the rabbis in Mekhilta de Rebbe Ishmael, that they rejected all forms of plastic expression. But “the rabbis” is too broad a rubric. Perhaps the Palestinian and Babylonian amoraim were more open to visual culture, including art in the same way that later Church Fathers were open to art in ways that earlier ones like Tertullian were not. Perhaps indeed they were even more open to other forms of aesthetic pleasure. Consider too in this light the Patriarchate. That the Patriarchate was not rabbinic does not preclude the fact that the rabbis included Rabban Gamliel as one of their own. Hence, the openness to plastic expression ascribed to Rabban Gamliel reflects a rabbinic position vis-à-vis figurative art, even if he was not actually a rabbi, historically. To put it polemically, then here’s why art needs to matter more than history. Levine is extremely cautious with historical judgments. As it turns out, we don’t really know why Jewish art emerges when, where, and as it does in the Byzantine period. The source-ideas range over several millennia and there is simply not enough historical and communal-political context and too many possible interpretations all of which combine to confound any simple consensus. Too much has to be left unresolved (p.328). I started to note where in the text Levine makes these caveats relatively well into the book (pp.242, 268, 269, 368, 436). Either it’s because I started tracking these methodological-epistemological caveats only as I read more deeply into the book or perhaps these caveats became clear to Levine himself only as the study progressed. In either case, absent the “historical contexts” promised in the book’s subtitle, all that leaves us is art, i.e. the “Visual Judaism” offered up by the title. Here’s how I’ve been given to understand it. Visual Judaism is constituted as a constellation of decorative and figurative elements: rosettes, five and six pointed stars, patterns of squares, interlocking circles, circles within squares, trains, hexagons, octagons, trapezoids, meanders, guilloches, arcs, loops, egg and dart motifs, interlaces, dentils, Hercules knots, shells, vines, wreaths, garlands, palm trees, lions, fruits, putti, eagles, fish, birds, griffins, biblical figures, menorot, lulav, showbread tables, human drawn from the Bible and from Greek mythology, and Zodiac figures with Helios situated at the center (pp. 226, 303, 317, 337). Why Visual Judaism, why figurative art? Because they could, because it looks fabulous. It’s a lush, plastic world in which geometric and organic elements mix with human and astral phenomena all of which form to into an artificial space, a micro-cosmos, an alternative universe alongside the one just outside its doors. On a much more speculative note, one thing I get from Levine by way of explanation is how to understand Byzantine Judaism or Visual Judaism in terms of copy culture. For example, Levine suggests that the proliferation of zodiacs in Jewish Palestine copy the paradigm set by the Jewish elites in Tiberias; the emergence of the menorah as a decorative element is copy of the Christian cross; the synagogue copies the Temple, sort of (chp.16, pp.345ff, 358). These examples suggest to me that the emergence of Jewish art was and probably remains profoundly mimetic. I’m reading now an MA thesis on digital religion whose author quotes W.J.T. Mitchell on the living, animate nature of images, which is supposed to have to do with the potency by which they reproduce and proliferate, evolving into new forms. (What Do Pictures Want? p.90). The reference to Mitchell seems particularly apposite here in relation to Byzantine/Visual Judaism. This entry was posted in uncategorized and tagged aesthetics, art, Jewish art, Judaism, synagogue, technology. Bookmark the permalink. Reblogged this on David Chery.